Tasting Notes: Milk chocolate, honey, nectarine, mandarin acidity, lingering toffee aftertaste. This coffee comes to us from the El Tambo municipality in the Cauca department of Colombia. Located nearby Popayan, the town of El Tambo has a wide range of microclimates within its borders, which contribute to a diverse variety of cup characteristics. There are approximately 8,900 families growing coffee on very small one hectare farms in the area. 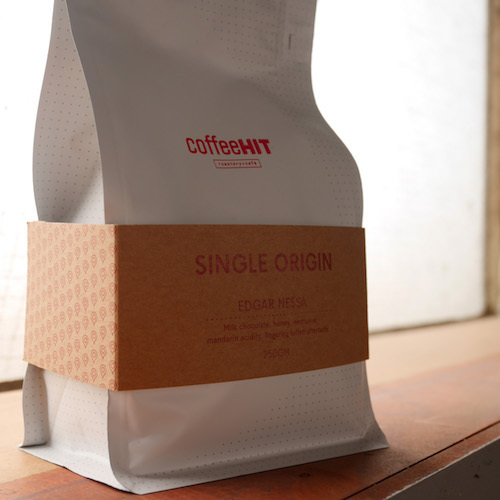 Traditionally, coffees in this area are blended together, however this particular coffee was sourced from a single smallholder in the region, named Edgar Nessa. With consistent average highs of 24 and lows of 13 degrees celsius, this medium-warm temperate climate coupled with the high temperature variance between day and night, give this coffee its stonefruit and citrus notes, as well as high sweetness and acidity. After selective hand picking, all wet milling is done on site. The coffee is fully washed and dried on patios covered by parabolic roof to aid drying temperatures.